This afternoon I was “baking” while transplanting Sweet Potato Vines. 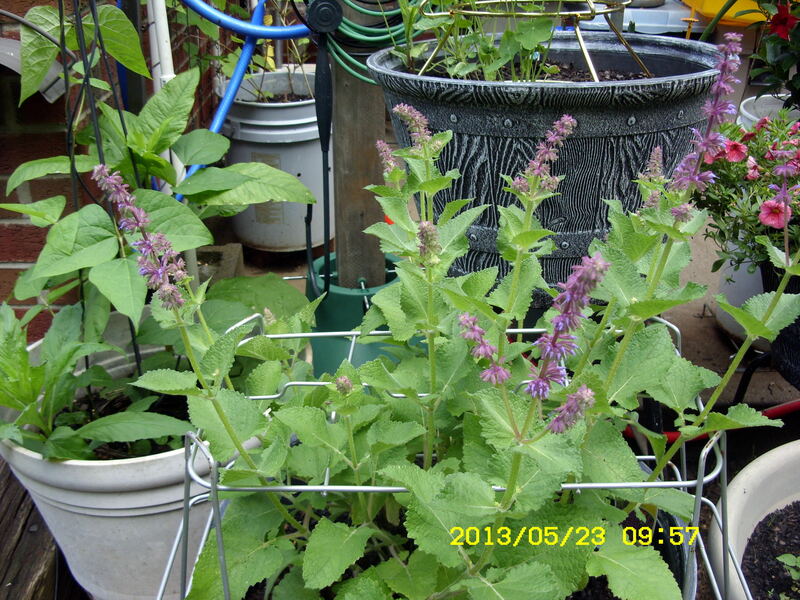 I could not keep enough water on the plants–in hanging baskets–so I’ve planned this project for a couple of weeks. First, I needed new planters (and I’ve shopped at several stores). 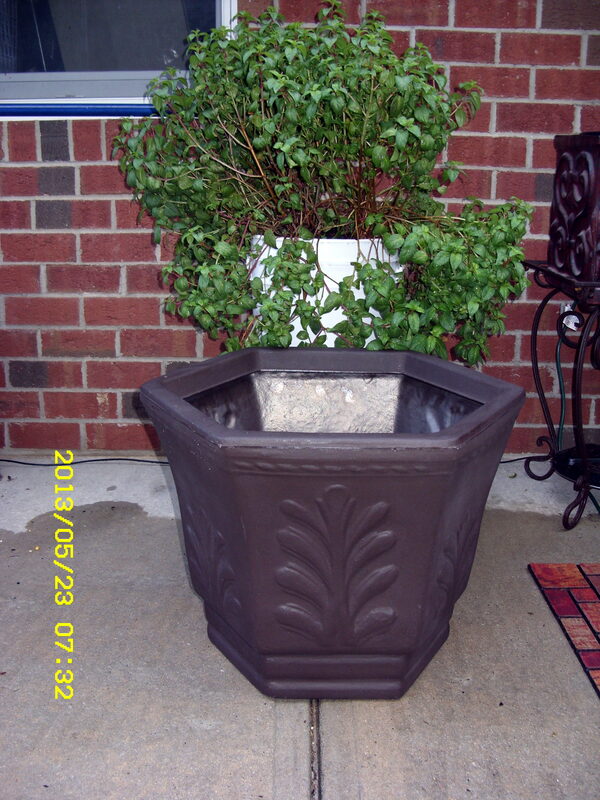 On Monday, I found a reasonably priced item for a large planter. That large white plastic box is a Little Tyke toy chest–and Goodwill was asking ninety-nine cents. How could I refuse?? PLANTERS ARE SO EXPENSIVE!!!!! It was 90 degrees (by my thermometer) while I prepared the first transplant (2:30 PM). Due to extreme heat, I retreated to the apartment until five o’clock when I completed the second transplant. 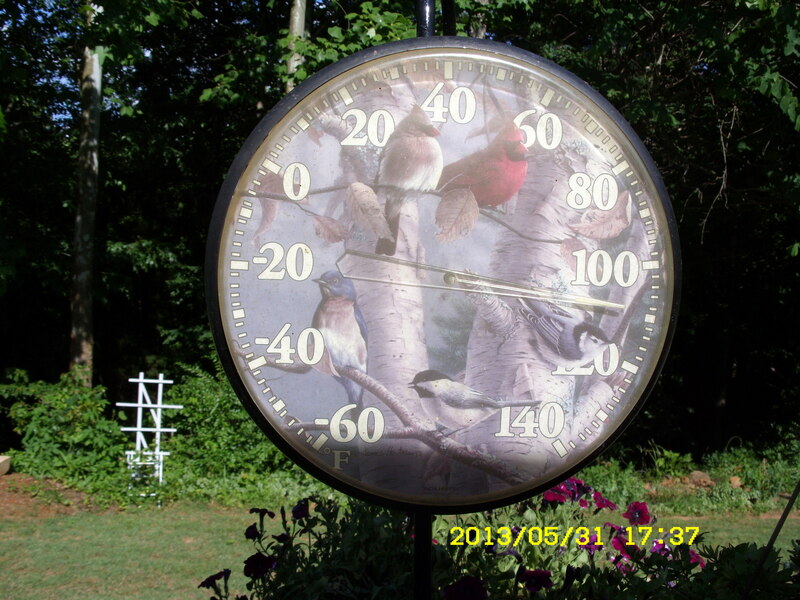 Look at the temperature on my thermometer. 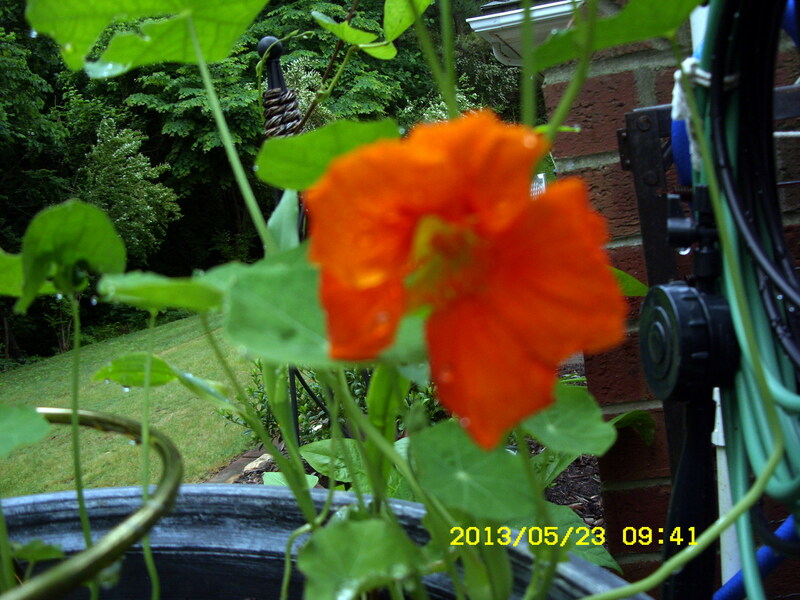 I didn’t stay out very long after placing the plant, soaking with water, and taking a quick picture. 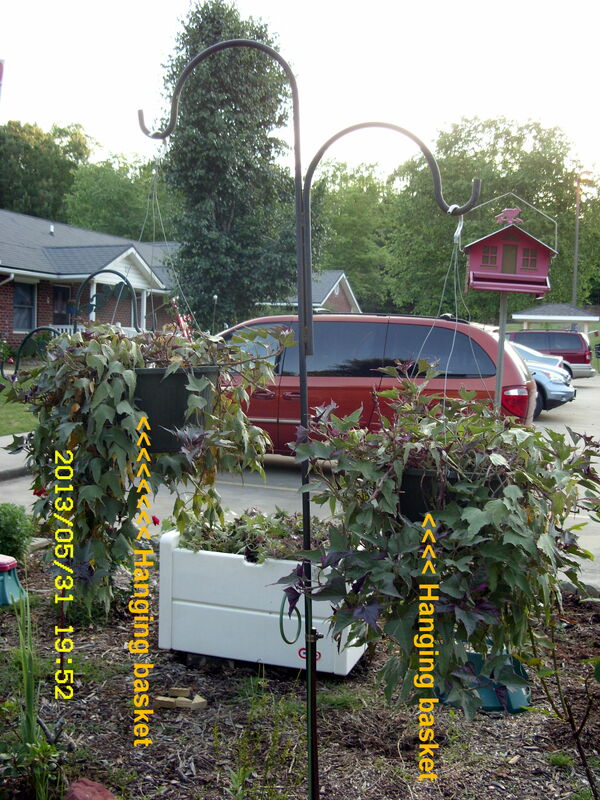 Fourth picture shows “two in the box” and two Sweet Potato Vines in their original hanging baskets. Soon they, too, will be transplanted. “Don’t Worry, Be Happy”: Remember that catchy tune, and words?? For some strange reason, I find myself singing that song while I work in “my other garden.” I’m receiving lots of compliments about the attractive area–and all at a minimum of expense. Mostly just lots of exercise, water, fertilizer and words of affection expressed to the curious collection of plants I inherited. 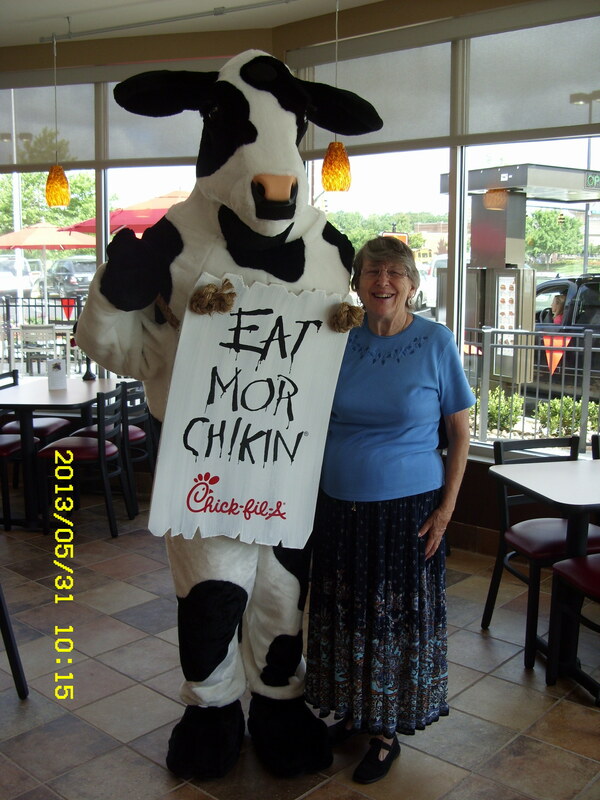 After my trip to the chiropractor this morning, I visited the grand opening of a Chick-fil-A. That isn’t a cardboard poster; it’s a warm-blooded mild-mannered bovine. Actually Sunday, June 2nd, 2013. 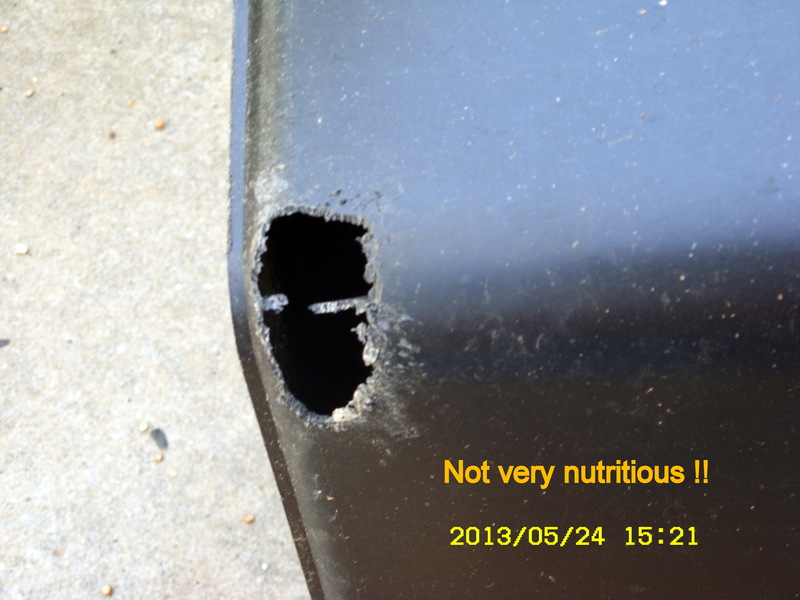 I wanted the pictures to follow details in earlier blogs. I affectionately call this “Pandora’s Garden.” Truthfully, I don’t know some of the plants (and haven’t been able to learn from the garden departments at Home Depot, Lowe’s and/or from the Internet). After they bloom (? ), I’ll be able to decide what they are and whether they should remain. Weren’t the contents of Pandora’s Box a mystery? Is nothing safe?? 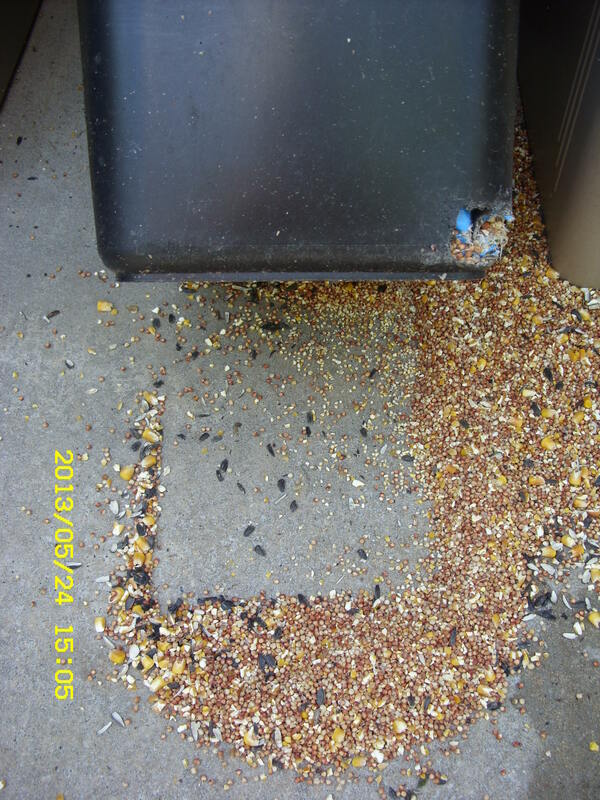 The squirrels don’t understand my admonition when I tell them the bird feeders–and seed containers–are off-limits!! 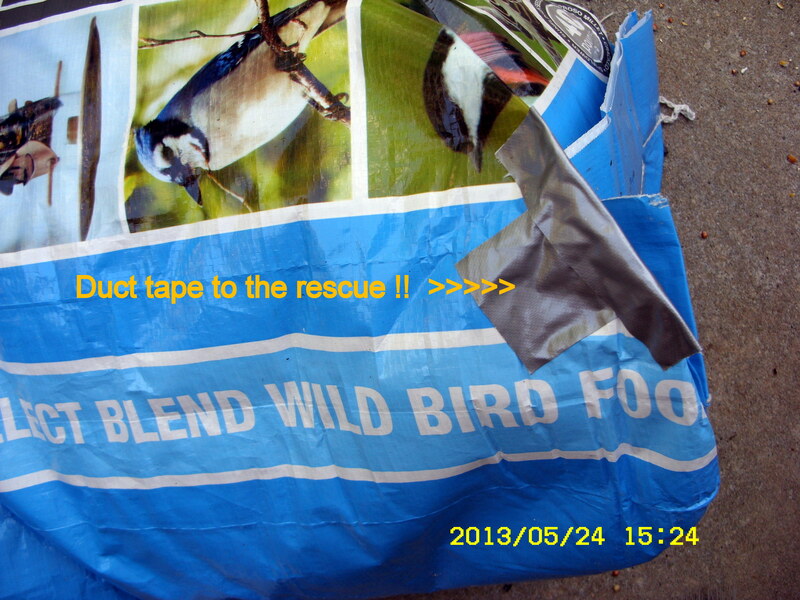 I reinforced the bottom of the heavy-duty plastic container, and patched the bag with duct tape. Frequently I quote an old saying: “Too soon old, too late smart.” Over two weeks ago I bought ten plants in hanging baskets. Beautiful plants!! However (with hindsight) they were (are) root-bound and require LOTS of water. 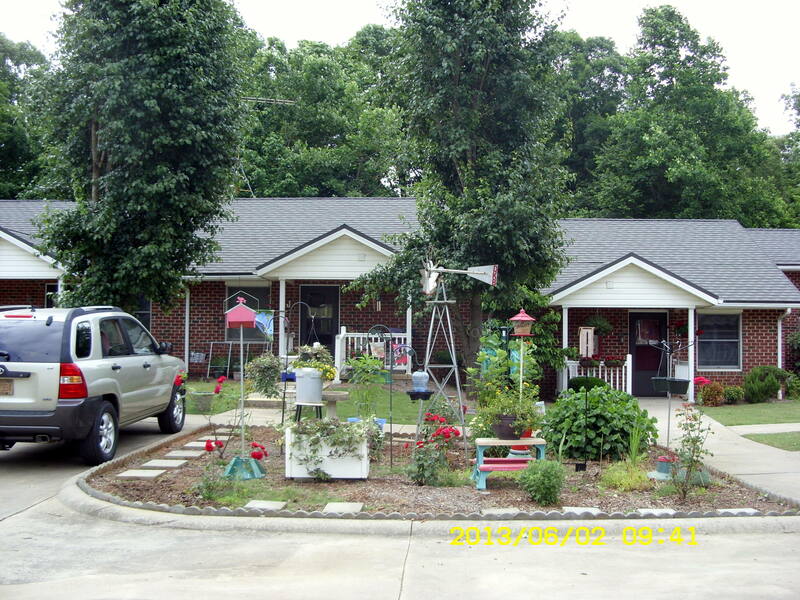 Yesterday (after visiting the chiropractor) I visited Garden Ridge. The variety of planters is endless!! I was searching for “just the right” planter for a Fuchsia plant. 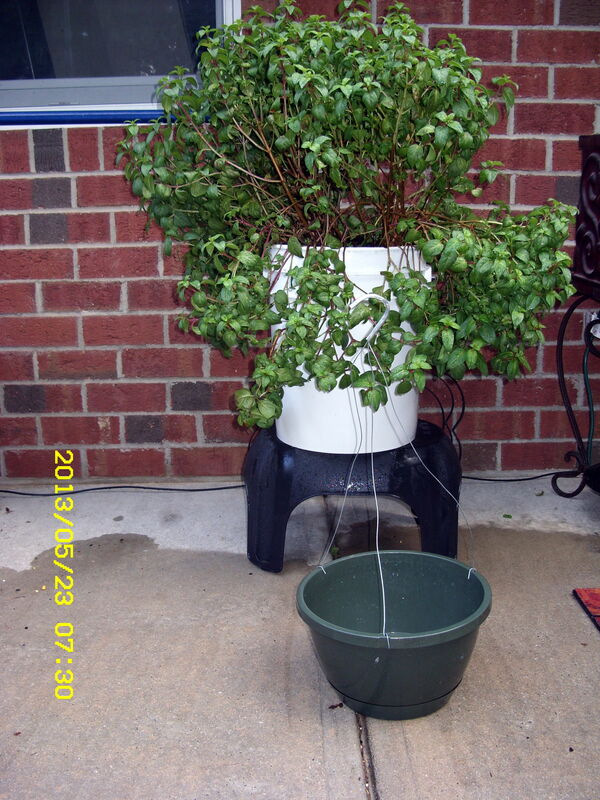 After work, I transplanted it into the white five-gallon pail–with lots of room for root growth. 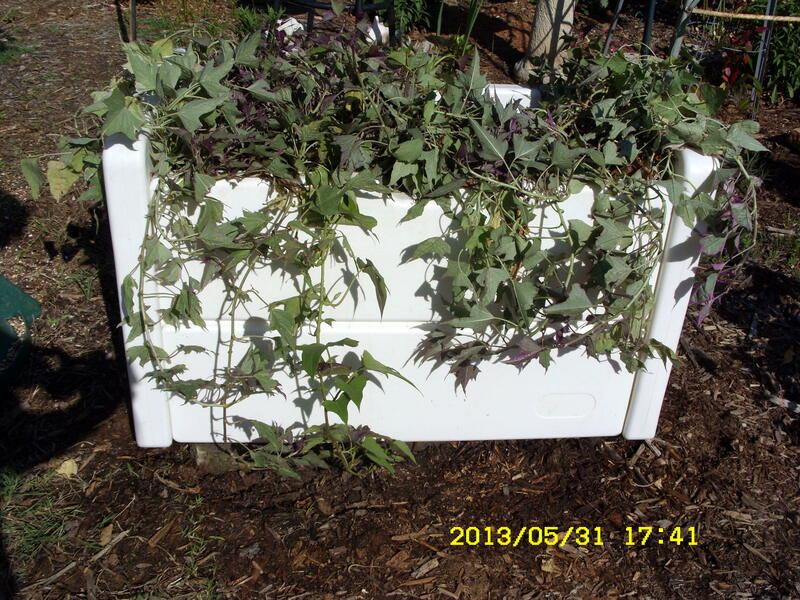 The white pail will be inserted in the large brown planter. Repeat: “Too soon old, too late smart.” The Fuchsia plant cost $7. ; the planter cost $50. ; white pail $5. ; organic soil over $10. ** Not a wise plant purchase!! 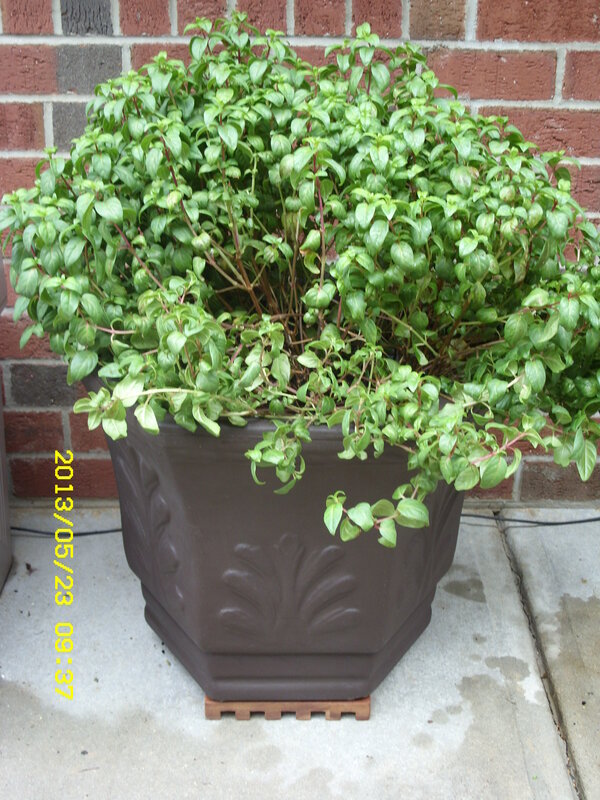 ** ~~ I’ve searched the web for information about Fuchsia and discovered my $7. purchase was destined for an early death if it continued to hang in “my other garden.” For one thing, too much sun!! 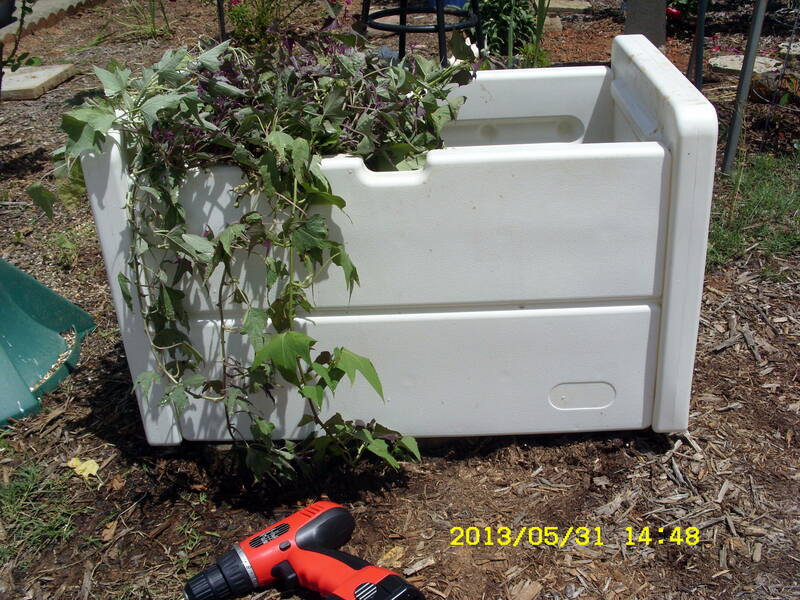 I’m uncertain how well the plant will grow so put it in the white pail rather than directly into the large planter. White pail fits inside the large planter. 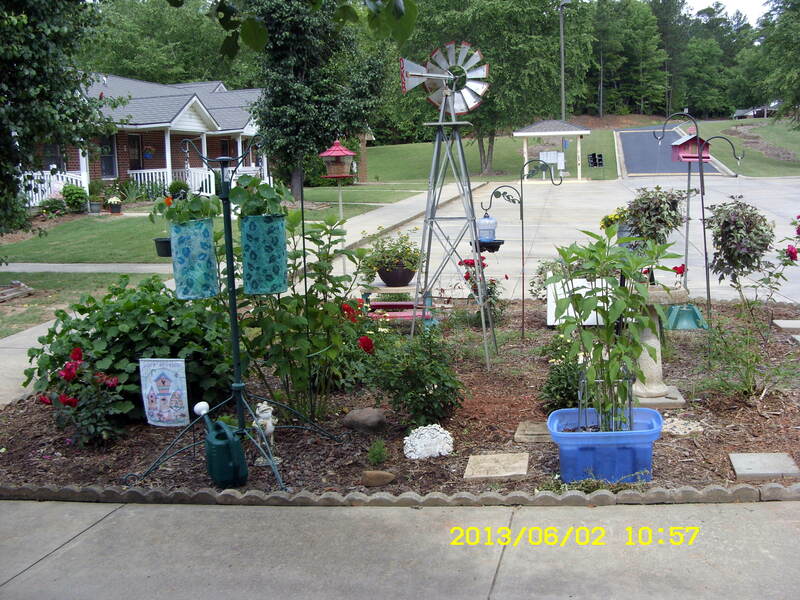 Can you believe that big plant came out of the small hanging basket (in the foreground of first picture)?? Hopefully the Fuchsia will thrive on the back patio with morning sun and afternoon shade. When it blooms, the Hummingbirds will love it!! ~~ At Garden Ridge, I couldn’t decide between planters so brought both home. 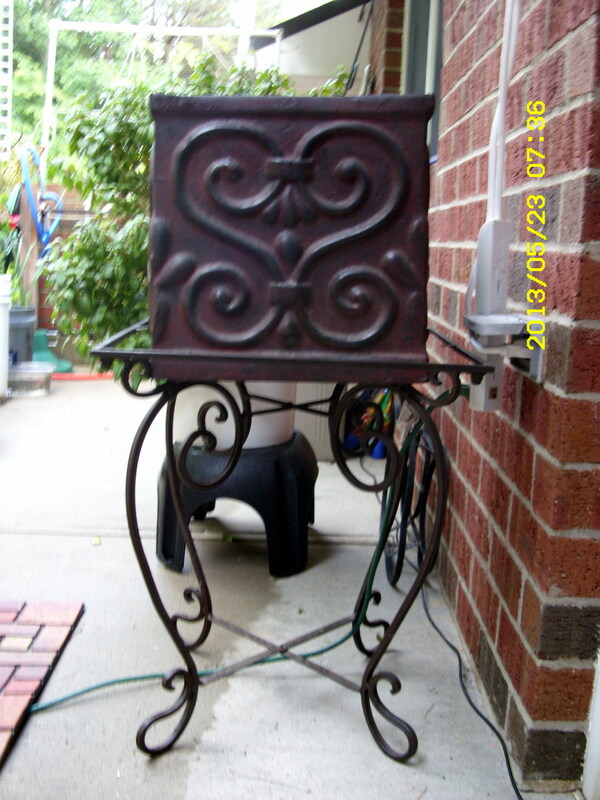 I like the way the square planter compliments the plant stand but face the question “What will I plant in it?”. 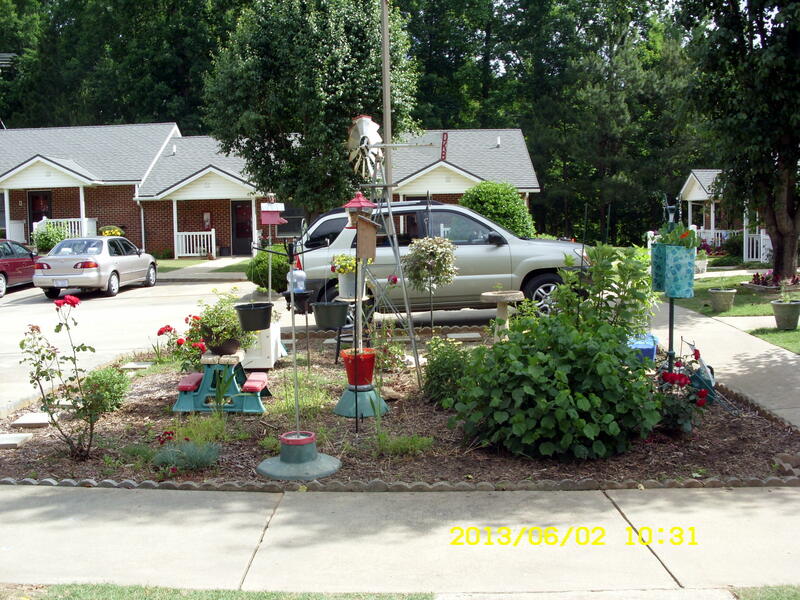 Postscript, Wednesday, May 29, 2013: I returned the square planter to Garden Ridge. I just could not justify the $40. planter!! Believe it or not, at Goodwill (en route home), I bought a Little Tyke white, large, heavy-duty plastic toy box for 99 cents. Yes, ninety-nine cents!! It is larger than two planters!! 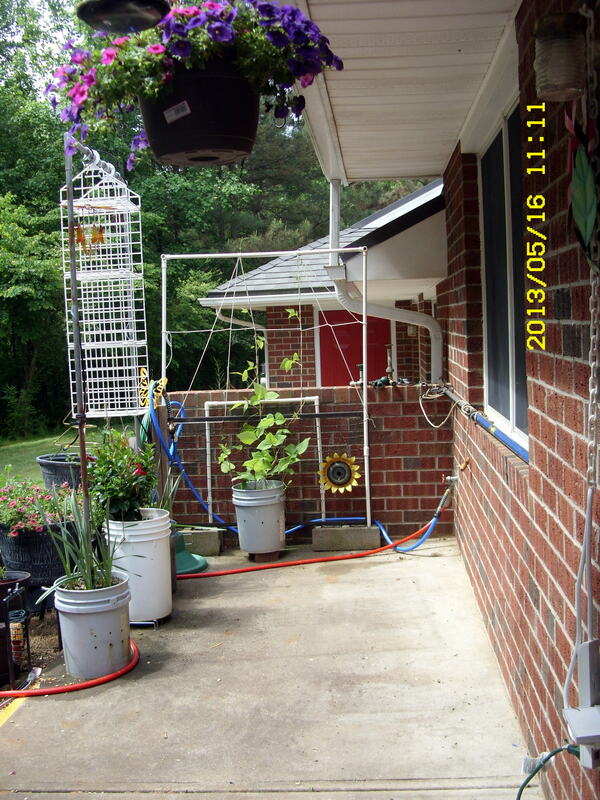 I won’t have it on that plant stand BUT envision it in “my other garden” with all four transplanted Sweet Potato Vines trailing down the sides. 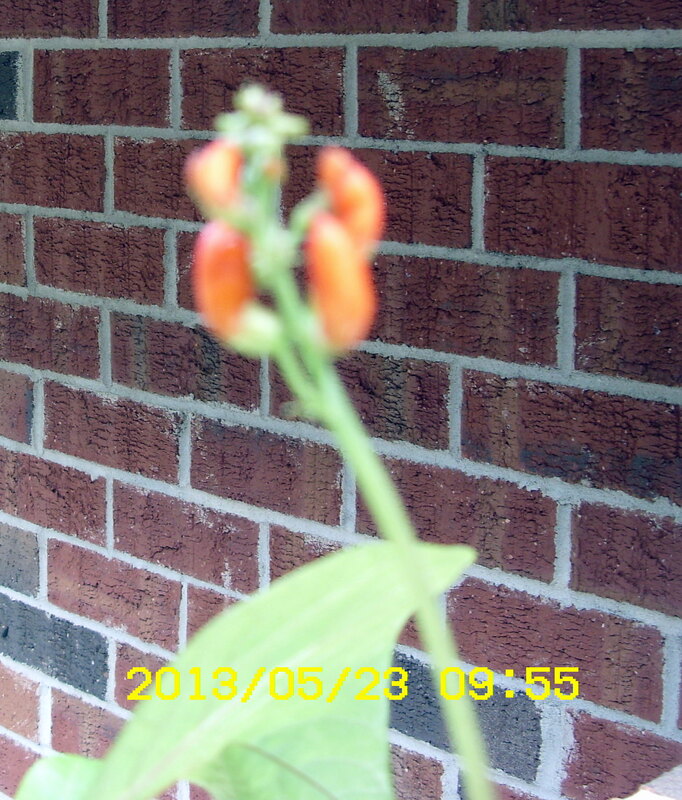 My first Nasturtium, first Scarlet Runner Bean bloom (not yet open), and Salvia. My garden gets prettier every day!! 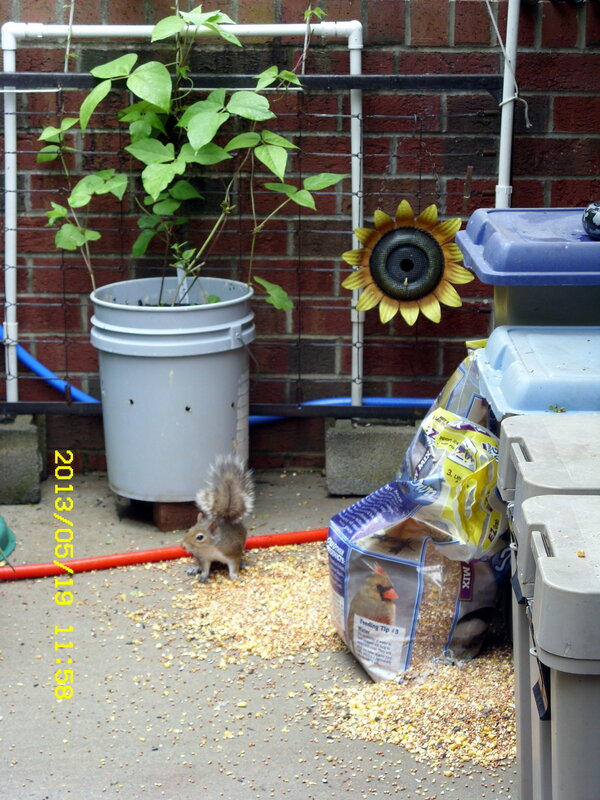 Postscript, Sunday, May 26, 2013: Surprise, surprise!! 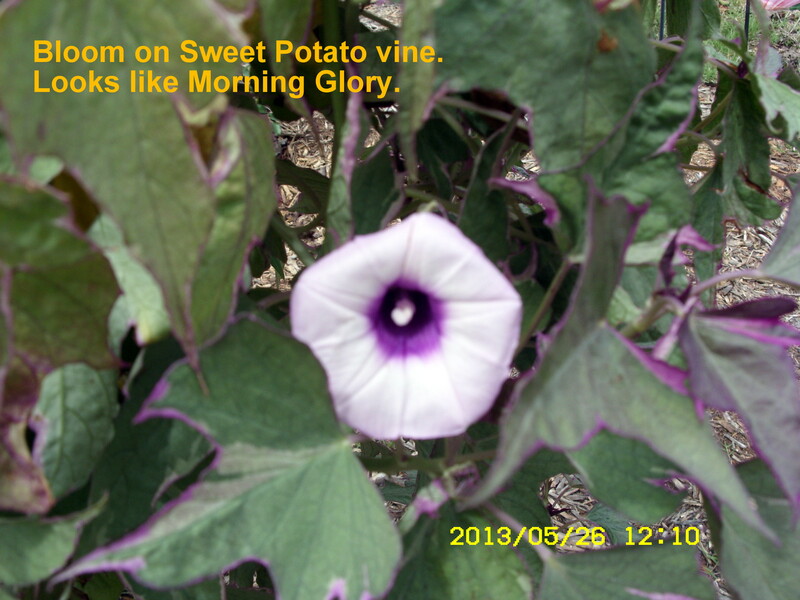 A bloom on the Sweet Potato Vine. I’m brokenhearted for the families in Moore, Oklahoma!! Addendum: It has only been an hour (or one-and-one-half hours) since I sprayed. My skin is itching and burning!! Frankly as an individual that practices “holistic health,” I did not want to buy and use a chemical. Bye, bye Ortho!! Now I’m heading for the shower.